Sometimes 10, 20 or 50 email accounts might not be enough for your company or organisation. But even then you might not want to invest on email hosting and increase your budget on IT. In this condition Yandex Mails for domains could be a solution. Definitely many people do not want to rely Russian or Chinese services for some reasons. I will not in the situation to comment on that. So, This post will not be interesting for such people. If your organization is small or need not more than 25 email accounts, I will recommend Zoho Mail service. Using your own web hosting service could be an option but it will have some risk (which i will discuss some other time). Yandex is 4th largest search engine of the world. It is most popular email and search engine provider in Russia. Its email service is reliable. If you want a complete free solution for more than hundreds or thousands accounts then this could, possibly, be the best solution. Visit https://pdd.yandex.ru/domains_add/ and add your domain name. Yandex will ask you to login (or signup) for a free @yandex.ru email id. At this level you will need to verify your mobile number (otherwise, you will have to solve captcha in Russian). Verify domain name: You may verify domain ownership either by uploading an html file OR by adding a CNAME record. Here is a screenshot. I prefer this method. Simply add a cname record and wait until it propagates. It will take a few minutes to few hours. It will be instant if you opt to upload a file to your root domain. 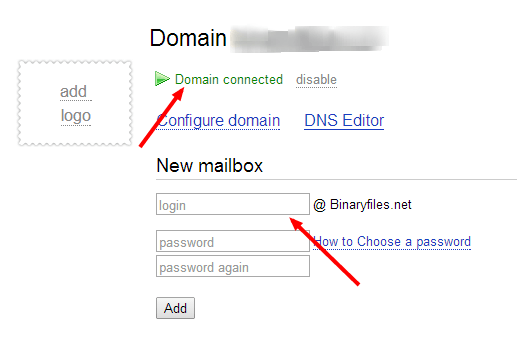 Here, you should not change your DNS as they suggested to change. Simply add the CNAME or Upload the file for domain verification. Add MX record and create your first email account. Note: if @ is invalid then try your naked domain. e.g. example.com (not www.example.com). Once you will verify your domain and setup MX records they will ask you to create a new email account with a password. On first sign in users will have to accept T&C and fill some simple information. Once you logged in to your account, you may change your preferred language from Russian to English. You will find a flag icon on the bottom-right of the mailbox you just signed in. Yandex is most popular site in Russia and holds 10 millions email accounts. Otherwise some personal preference the service is reliable and secure. You will instantly get 1000 free accounts for your business. You may also offer open registration for anyone from the public or your visitors, like Microsoft once did. Since this site is a Russian LLC, so you will be bounded by the law of the Russian Federation. FYI, Yandex is listed on Nasdaq and you may track all news about this company on techcrunch also. For such users I will recommend you to use your existing web hosting (it will be free for most of us) or paid email hosting like Google Apps or Microsoft Office 365. If you have any problem in configuring your server or domain setup, leave a comment below. You may also refer to your domain host or registrar guide for help. Thnx Anand, how do we add new email ids under this Custom Domain Email a/c? how do we add new email id’s under this Custom Domain Email account.? Can you change the default language of Yandex for domains to English? Yes, you can change the default language to English (or many other language). Check the “flag icon” on the lower-right corner. I meant, the default language for every user, so other users that I add don’t have to change it via the flag icon? Unfortunately, This is not possible for Yandex (when I last checked). Their admin panel is very simple. You will not find this kind of essential settings. Hi, thanks a lot for your guide. Helped me a lot trough the process. However i’m having trouble trying to add additional admins for the mailboxes. The official Yandex instructions (http://help.yandex.com/domain/additional/additional-admins.xml#add) are not working and there’s no further Help assistance. Do you know a workaround for adding administrators?